Big tech companies like NTT DoCoMo come up with dozens of unusual applications for their gear every year, but most tend to end up consigned to glossy brochures that describe some anodyne ‘perfect’ future. One bizzaro contraption that is apparently out in the wild is Big D’s FOMA-based Videophone Alcohol Check System [scroll down to the bottom]. 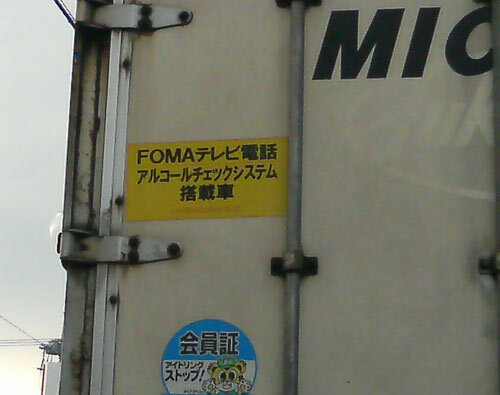 As the above photo shows, it’s in use on at least one truck round these parts. The Videophone Alcohol Check System service enables bus and delivery companies to easily monitor drivers in the field at any time. Drivers blow into a breathalyzer connected to a handset and the alcohol concentration is transmitted to a computer at the head office. Inebriated drivers cannot have someone else take the test for them, because the person’s identity is confirmed via the videophone’s camera as they take the test. Not to spoil their fun or anything, but isn’t it all a bit Orwellian?